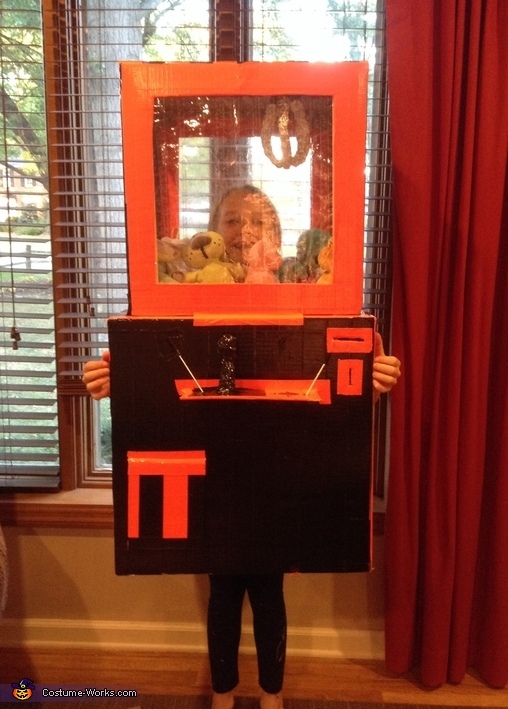 This costume is a claw machine that is worn by My daughter Lucy Courtney. She was inspired by her teacher Mr. Auslander and a boy named Cane. When she was at school her teacher showed her class a video about a boy named Cane who made an arcade out of cardboard and is celebrated all over the world and is now called the global cardboard challenge. Her teacher Showed her class the video because they were going to do the global cardboard challenge at her school along with 5 other fifth grade classes. Lucy got the idea when she was building her game and told me all about it when she got home. A couple weeks later she got all of the supply's she needed which was: Two rolls of black duck tape, two rolls of orange duck tape, two rolls of clear tape, tin foil and string which cost about $53.00.